I could describe Gold Motel’s self-titled sophomore effort with words such as “summery,” “breezy” and “upbeat,” and it would all be true. But since every other write-up on them seems to use those words—and I don’t really think it gives full justice to what the band has to offer--I’m instead going to focus on another adjective: bittersweet. We all know that too much sugar is bad for you. Whenever you go for the double fudge caramel sundae it might taste pretty good when you’re eating it, but after you’re done chances are you feel a bit empty and uneasy. The same can be said about music; sugary can be good, but too sugary just leaves you longing for more sustenance. Gold Motel seem to know this, as evidenced by their tendency to balance sweet, instantly pleasing melodies with the perfect touch of bitterness, sadness, or longing. I think that’s why I can latch onto a Gold Motel song so easily while being indifferent to one from a band like Best Coast. The music comes from a similar sunshiney place, but Gold Motel inject a lot more soul and believability into it (in addition to simply being better songwriters). The quintet begin the new record with “Brand New Kind of Blue,” a satisfying helping of three-minute power pop exemplifying their mastery of the bittersweet. An earworm guitar melody starts it off before the bright vocals of Greta Morgan come in to tell us about “drifting in a brand new kind of blue” and hoping that she’s “only passing through.” It's a fantastic opener. “These Sore Eyes” and “Musicians” sound similarly lively, and are also similarly based in reality in terms of lyrics. The former pairs a ‘60s guitar-pop vibe with words of longing and heartbreak, while the latter deals with the unfair reality of many talented people; “Most of my friends are musicians in the subway station / Making amends with the dark, indifferent world,” guitarist Dan Duszynski sings in his sole lead vocal on the record. 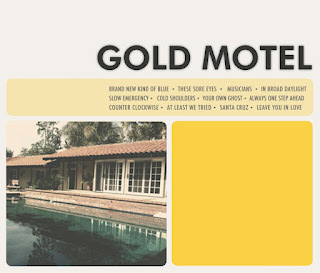 Gold Motel also finds the band a bit more adventurous than on their 2010 debut Summer House. “Cold Shoulders” (a definite highlight which devoted fans will have heard before as the A side to a previous vinyl single release), while still in firmly in the pop realm, takes a bit more aggressive approach than nearly all their other material; more New York than L.A., maybe. “At Least We Tried” further explores that territory. “Your Own Ghost” has them playing with a smooth, almost dancey beat along with more cryptic lyrics than usual, and on “Counter Clockwise” they even dabble in hazy, spacey atmospherics. I was an instant fan of Summer House and still play it often, but Gold Motel have managed to top themselves on their latest; their self-titled comes across as a bit more cohesive while at the same time expanding the palette for a more colorful collection of songs. It might be the most fun record you hear all summer, but it's got enough substance that you probably won't want to shelf it once you have to trade the shorts and flip-flops for the winter coat. 'Gold Motel' is out today. The band will be doing an in-store performance at Saki on July 8th as well as a show at Schubas on July 26th. Listen to the track 'Cold Shoulders' below.